Soil monitoring - Know your soil | Infonet Biovision Home. (c) Charles K.K. Gachene, Gathiru Kimaru, RELMA, Technical Handbook No.30. Soil monitoring is very important for a sustainable soil management. It involves analysing the soil through soil tests and field observations, and seeing how the soil changes over time. Farmers can compare the results from year to year, and evaluate the effectiveness of their management. So, they can determine what changes are required to improve the soil and increase production. Knowing and understanding the soil is the key to its improvement. Soil has many physical, chemical and biological properties that affect the growth of plants. The degradation of the physical soil properties has considerable consequence on plant growth, yield and quality of crops, regardless the soil plant nutrient. Degraded physical soil properties take considerable time and cost to correct. The degradation of soil properties can increase the risk of soil erosion by water or wind with great impact on society. The way the farm is managed has deep effects on the soil which strongly influence the long term profits. Farmers need reliable, quick, and easy tools to help them making decisions which will lead to sustainable land management. For organic farmers is a regular observation and soil evaluation an ongoing process. Digging a hole in the field can provide information such as depth and colour of the different horizons, soil structure including hardpan formation, root structures and earthworm populations and other soil life. Relevant to soil fertility are sand, silt and clay. Textural classes such as sandy, loamy or clay soils are based on the relative proportion of these fine soil components. Increase of the proportion of any fraction makes the soil more or less suitable for plant growth. For example, a high proportion of sand in the soil, makes it well aerated, ease drainage of excessive water and it is easy to cultivate. Though, plants will suffer from water stress, as sand does not retain water. Opposite to a sandy soil, a soil with a high clay content retains well moisture and nutrients but is not well aerated, is susceptible for waterlogging and is difficult to cultivate. Soil texture influences other soil properties and components of soil fertility, e.g. water-holding capacity, soil porosity, drainage, soil structure, aeration, nutrient supply and retention, soil life and soil workability and trafficability. Loamy soils are the most suitable for cropping as they contain favourable proportions of sand, silt and clay. Workability of loamy soils is medium. Soil texture varies often with soil depth. For this method, you need transparent plastic bottles of equal size with caps, clean water and some salt. 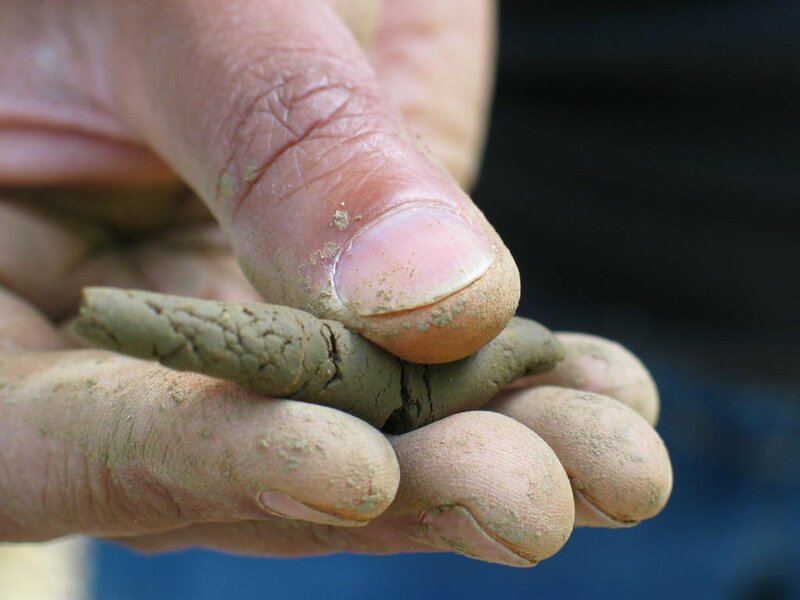 After four hours waiting, you can measure the thickness of the soil layers: the finest layer is clay, on top, the next is silt, following sand and at the bottom the coarsest, gravel. Calculate the percentage of each soil fraction (clay, silt, sand and gravel) by dividing the thickness of each layer with the total thickness of the soil and multiplying it by 100%. Soil texture can also be determined in the laboratory (particle size analysis). Soil that is easy to work allows water to reach roots efficiently and is less prone to compaction. If tilling or digging the soil produces cloddy or plate like clumps, the workability is low. you can simply judge the effort necessary to prepare beds for planting. Clayey soils are normally hard to work. These soils are scarce in spores absorbing water very slowly. It is likely to form big lumps if worked when wet. It needs substantial organic materials to open channels for aeration and drainage. Compost, manure, leaf mold, rice hulls, peat moss, coarse sand, sawdust and wood chips are good choices for that. Liming crops can also improve its texture and free locked-up nutrients for plant use. Loamy soils are easy to work and very productive. They are very porous, thus well aerated and drained, yet able to retain moisture as it is needed. Loamy soils can retain nutrients very well. They might only need regular infusions of organic matter to maintain its already excellent fertility and structure. Sandy soils are easy to work, fast drying and low in nutrients because soluble plant nutrients are lost through leaching. For better performance, sandy soils need continual adding of large amounts of organic matter to hold water and nutrients within the range of plant roots. Use of peat moss, compost, leaf mold or sawdust in topsoil. Green manures help to build soil structure. The term 'Soil structure' describes the way soil particles are grouped into aggregates or crumbs. Calcium helps bind the aggregates together, and in combination with the clay-humus complex, provides the basis of soil structure. Soil structure is affected by biological activity, organic matter, cultivation and tillage practices. It can be estimated according to shape, size, firmness, porosity and relative abundance of soil clods and aggregates. An ideal soil structure is often described as granular or crumb-like, is stable and resistant to erosion. It provides good air and water movement through the different pore sizes. Plant roots and soil organisms travel through a variety of different pore sizes, helping maintaining soil structure. All tillage operations, e.g. seed bed preparation, can harm soil structure. This can lead to compacted soils, which is easily eroded and has poor aeration. Careful cultivation and returning crop residues can enhance soil structure. Organic matter and soil biological activity improve structural stability and can rebuild degraded soil structure. It is vital to return organic matter to the soil and to maintain its biological activity. Soil colour is a good indicator of soil quality and shows changes in humus content of soils. In general, the darker the colour is, the greater is the amount of organic matter in the soil. Changes from dark braun or black to lighter tone indicate loss of humus content under a particular land use. Soil colour can also be an indicator of soil drainage and the degree of soil aeration. Grey blue colours indicate that the soil is poorly drained and poorly aerated for long periods. This reduces the ability of plants to take up water and nutrients, causing reduced growth and ill-thrift. Brown-yellow brown, reddish-brown and red soils without mottles indicate well-aerated, well drained conditions. Humus is decomposed organic matter in soils that are aerobic for part of the year.Humus is dark brown and amorphous, having lost all trace of the structure and composition of the vegetable and animal matter from which it was derived. It adsorbs and holds nutrients in a plant-available form. The acidity or alkalinity of the soil influences both nutrient availability and biological activity. Soil pH indicates the acidity or alkalinity of soil solution and is measured in pH units. The pH (logarithmic) scale goes from 0 to 14. A pH of 7 is neutral. A pH less than 7 is acidic. A pH greater than 7 is basic or alkaline (sweet). A logarithmic scale means that a pH of 5 is ten times more acid than a pH of 6 and 100 times more acid than a pH of 7. Soils can be acid, neutral or alkaline depending on the parent material (soils developed from basic rocks generally have higher pH values than those formed from acid rocks), rainfall (water leaches basic nutrients like magnesium and calcium) or application of fertilizers containing ammonium, speeding the rate of acidity development. Soil pH has a big influence on the uptake of minerals by plants. Increasing soil pH (e.g. by application of lime) decreases the uptake of Iron (Fe), Zinc (Zn) and Cobalt (Co), and increases the uptake of Selenium (Se) and Molybdenum (Mo) and, to a smaller extent, sulphur (S). The increase intake of some minerals can cause a lower absorbability in the rumen due to element deficiencies. For example, increased levels of Mo and S on high pH soils, reduces the absorbability of Copper (Cu). On soils with inherently low levels of minerals over-liming should be avoided. Neutral soils have a pH between 6.6 and 7.3. Most common vegetables and fruits grow best on soils that are slightly acid to neutral (pH 6.5 to 7.3). Soils in this pH range offer the best environment for microorganisms that convert atmospheric nitrogen and form humus. Also earthworms find the best conditions, producing a good crumb structure and therefore a good tilth. At this level, all of the essential mineral nutrients are available to plants. Alkaline soils have a pH between 7.4 to > 9. Very alkaline soils rob nutrients from growing plants and destroy soil structure. It also breaks humus apart and causes a concetration of salts which inhibit plant growth. If the field is located in an area of low rainfall, the high pH is probably due to accumulated salts. Flush these salts below the root zone of sensitive plants such as beans, carrots, onions and peppers, by watering regularly with non saline water. Acid soils have a pH from 1 to 6.5. Conditions for microorganisms are not given, so that decomposition does not occur, resulting in a decline of organic matter and in poor soil structures. Aluminium and manganese are very soluble in highly acidic soils, becoming toxic to plants. Strong acidity limits nutrient availability to plants. Work in the soil bone meal, pulverized egg shells, clam shells, oyster shells, unleached hardwood ashes or a form of fine-ground agricultural lime. Do not apply lime around acid loving plants or there where runoff water may take the lime downhill to such plants. After lime application, changes can be seen only on the second year. Repeat liming every fourth or fifth year, depending on the results of soils tests. Soils must be able to retain moisture for plant growth. Soil moisture should be available to the plants. Soils must be sufficiently moist and aerated (not waterlogged) to maintain photosynthesis and transpiration and to enable the uptake of nutrients by the plants. Maintaining adequate soil moisture content during the growing season is critical to nutrient use efficiency. Soils with moisture deficiency such as sandy soils show a low water-holding capacity and high evaporation. The goal of soil moisture management is to maximise the intake of rainwater into the soil and to maintain the soil moisture content at near field capacity as long as possible during the growing season. Mulching with crop residues or plastic sheets to slow runoff and reduce evaporation losses. It can also prevent crop drought stress during dry spells in the subhumid regions, especially during the early stage of crop growth. Runoff harvesting and microcatchments improves soil moisture storage during the cropping season. Planting tree or grass barriers along contour bunds and terraces can reduce runoff and soil erosion in slopes. Leucaena (Leucaena leucocephala), a fast growing leguminous tree and Vetiver (Vetiveria spp. ), a deep rooting grass are widely promoted species for soil and water conservation on sloping lands in humid and subhumid regions. In the semiarid regions of Africa, early sowing and low planting density of millet and other dryland crops are common practices. Also drought resistant crops are usually cultivated. In semiarid regions with a distinct but short rainy season (three to four months) deep rooting sorghum, pearl millet and leguminous such as pigeon pea and cowpea are commonly grown. Where the rainfall is unreliable, farmers cultivate finger millet. These crops become dormant during a long drought period and then recover when rains proceed. Water holding capacity depends on soil texture and structure. Fine textured soils (e.g. clayey soils) are able to retain more water than coarse-textured soils (e.g. sandy soils). These are prone to leaching as they cannot hold nutrients without clay. Tillage also affects the water storage capacity of soils. For a soil to hold enough water for plant growth, it must have a good structure, which can be attained if the soil has high amounts of organic matter. 1) Remove caps and cut off the base of the bottles and place them upside-down in sand. Support the bottles with stones, if necessary. 2) Take the soil sample in its plastic bag and brake it into small pieces. 3) Fill each bottle half way with soil from each sample and pour water in until the soil is saturated or until it can not absorb more water. 4) Fill the bottles with more water, let the water infiltrate. Use a watch to monitor the duration of infiltration (in minutes). Then compare the infiltration rate of water through the soil. NOTE: Infiltration rate is influenced by soil moisture and soil type. Coarse sandy soils allow rapid infiltration; clayey soils have a slow or no infiltration of water. Building soil organic matter will shorten the infiltration time. Surface ponding and the duration water remains on the soil surface after a heavy rainfall indicate the rate of infiltration into and through the soil, a high water table, and the time the soil remains saturated. To assess the degree of surface ponding observe how long water takes to disappear after after a heavy rainfall on soils that were at or near saturation. If after 2 to 4 days after heavy rainfall only some surface ponding occurs, that means that most surface water infiltrates the soil and the soil has moderate drainage. Prolonged waterlogging depletes oxygen inducing root stress, a restrict root respiration and growth. It causes the death of fine roots responsible for nutrient and water uptake and increases the chance for pests and diseases such as Rhizoctonia, Pythium and Fusarium root rot. Crops decline in vigour, have restricted shoot and stunted growth, lose colour and die. Bare soils. Growing plants and a crop residue cover absorb the energy of raindrops and slow the flow of runoff, reducing the risk of erosion. Roots hold soil in place and contribute organic matter, which further stabilizes the soil. Soils in slopes. Long, uninterrupted slopes are especially prone to erosion because water can pick up speed as it travels downslope. Clays and silts. 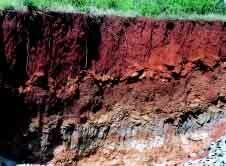 Fine- to medium-textured soils low in organic matter, are very prone to water erosion. They can be prone to crusting. Crusting reduces water infiltration (the movement of water into the ground). Less infiltration means more runoff and a greater risk of water erosion. Smaller soil particles are also easier to erode by wind than larger ones. Soils with a shallow, impermeable layer (hardpans) are prone to erosion because hardpans limit infiltration deeper into the soil. Organic matter helps hold soil particles together in soil aggregates; these aggregates are harder for the wind to move than small individual soil particles. A cover of plants or plant residues protects the soil. The greater the intensity of rainfall, the higher the risk of water erosion; Also high wind speeds and persistent winds have more erosive power. Minimise tillage. Tillage makes the soil prone to water and wind erosion by decreasing the size and stability of aggregates, thus decreasing infiltration, and by burying the crop residue cover, drying out the soil, decreasing soil organic matter and decreasing soil aggregate size. Gachene, C.K.K. and Kimaru, G. (2003). Soil Fertility and Land Productivity - A guide for extension workers in the eastern Africa region. Technical Handbook No.30. Regional Land Management Unit (RELMA)/ Swedish International Development Cooperation Agency (Sida). ISBN: 9966-896-66-X.